To enjoy playing golf, to play your best golf, and to improve, you must see everything about your golf game in a positive light. Criticizing gets you nowhere. Put only the good shots, the great shots, in your memory. Magnify them, glorify them, let them define how you play golf. Tell yourself, “That’s how I play golf.” Those shots weren’t accidents. They truly are how you play golf. Yes, you do hit bad shots. Everybody does. Do you ignore them? Of course you do! Put them out of your mind. The only shots to carry with you are the good ones. Never say, “I can’t hit this shot,” or, “I can’t [anything].” Never say that. Work only with true things. It is not true that you can’t hit a particular shot. It is true that you didn’t hit it. So when you flub one, say to yourself, “I didn’t hit that shot, but next time I will.” Always use positive words. Write down your good shots. 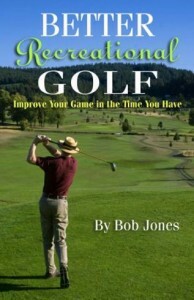 Keep a notebook in which you record the results of each round of golf you play. In this book, write down the good shots only. Write down the setting, what club you used, describe the shot, and the result. No symbology! Use words! Write down a narrative that inspires you and re-read it before you play. Remind yourself of how good you are. Got a hole on your home course that’s hard for you? Write down the times you played it well and memorize what you wrote. Review those notes before you go out. Put the good times in your head. If you had a good run of well-played holes, write down how you felt during that time. Give yourself some advice on how to feel like that at will instead of it just happening. During a good streak on the course, enjoy it and keep it going. If you have one good hole, have two more. There is no such thing as “playing over your head.” You wouldn’t be playing this well if you weren’t capable of it. Stay positive about your game. Hit only the shots you’re good at with the clubs you’re good at. Sure, you‘re allowed to carry fourteen clubs, but if there are a few you don’t feel comfortable with, leave them home! Find a way to get the ball around the course hitting the shots you like with the clubs you like, and find a way to hit those shots with those clubs as often as you can. Identify your skills and beat the course to death with them. Stand over every shot believing that it will turn out well. If you’re unsure of yourself, choose a different shot or a different club. Is there a shot you need but don’t hit well? Get a lesson, learn how to hit it so you look forward to hitting it during play. When the round is over, talk to your friends about the good shots you hit, and that they hit. Review the round in a positive way. Change the subject if someone starts talking about their flubs. Come away from the course happy, believing that you had a chance to display your skills to their full advantage, and that next time out you’ll do it again. Always be positive about your golf. Allow nothing negative into your golf game. Always be positive. When you hit a ball into a water hazard, the procedures can be complicated. It all depends on which kind of water hazard you hit into. They can be marked with either yellow stakes or red stakes, and the procedure for each is different. This week we will talk about hazards marked by yellow stakes. Water hazards marked by red stakes are lateral water hazards, which we will discuss next week. This is all in Rule 26. The first thing to do is to determine whether or not your ball is in the hazard. If you cannot find your ball, the rules say it is a question of fact that it is in the water hazard. For example, you saw it go into the pond and splash, or you saw it roll toward the pond and disappear in weeds lining the pond. In the absence of such knowledge or virtual certainty that the ball is in the water hazard, you must call it a lost ball and proceed accordingly. It is possible that your ball can be in the hazard, but not in any water. The boundary of a water hazard is defined by yellow stakes, and is the straight line connecting the nearest outside faces of adjoining yellow stakes. If your ball is inside this line, or even resting on it, your ball is in the hazard. The stakes themselves are inside the hazard, and are obstructions. If you find your ball, you may play it without penalty. You may not ground your club in the hazard at any time before the stroke is made, and you may not remove any loose impediments in the hazard. If you do not find the ball, or you do but choose not to play it, you have two options (Rule 26-1). Both are accompanied by a one-stroke penalty. In both cases, you may clean your ball or substitute another one. If the ball is moving in a water hazard, you may make a stroke at it, but you must do so without delay. You cannot wait until a moving ball comes to a more favorable position for the stroke. You may lift the ball while it is moving in the water in order to exercise one of the two options above. (a) You are in a bunker and hit the ball over the green into a water hazard on the other side of the green, and the ball is not playable from there. You may either (1) go around to the tee side of the water hazard and play over the hazard after dropping a ball on the extended line between the hole and the spot where the ball crossed into the hazard, or (2) drop a ball in the bunker from where the original stroke was played. There’s a one-stroke penalty in each case. (b) There was reason to believe your ball went into the hazard, but you couldn’t find it and played another ball under Rule 26-1. Then later find your original ball and it was not in the hazard. Unfortunately, when you made a stroke on the new ball, that became the ball in play, and the original ball became a lost ball. (c) If a ball is lost near a water hazard, but there is no reasonable evidence that it is in the hazard, it must be treated as a lost ball if not found, not as a ball lost in a water hazard. 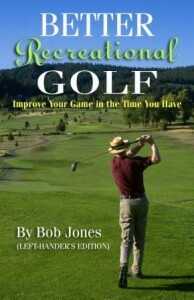 That’s to prevent someone from avoiding the lost ball penalties, which are more severe than the water hazard penalties. Golf is our recreation, our hobby, our happiness. Unless you play for money, that’s all it is. Every now and then, I play with a golfer who tells me that he used to play with too much intensity, and would get so upset after a bad shot, and so on, and that he finally stopped doing all that. The game got a lot more fun, he enjoyed his company more, and for sure, his company enjoyed him. After your round is over, ask yourself these three questions. Are you happier than you were before you teed off? Did your playing partners enjoy having you in their group? Are you at peace with how you played? If you can say yes to each of those questions, you had a good day at the course. If you shot a good score, so much the better. After a round of golf, what do you think back on? Do you talk about the score you could have had if only you had done this or that? Most people do. How about the good shots? Do you spend much time on them? I think we tend to take our best shots for granted, even the 45-foot putt that we had no business making, but in remembering the good shots lies the key to better golf. The bad shots happen. Let ‘em go. Remember only the good shots. You have the ability to hit them or you wouldn’t have done it. Build on them. Remember what they looked like, and most importantly remember what it felt like, not just physically, but mentally, as you were hitting them. This feeling of mind is what will lead you to hitting more good shots just like them. You might say “How can you remember a feeling,” but just as the image of the shot persists in your memory, so the does the memory of your mental state during the shot. That might not be something you’re used to remembering, but it’s there. You just have to look for it. Don’t worry, it’s not hiding. Just start thinking back and you’ll find it right away. Why is this important? It’s because the mind leads the body. The state of the mind directly influences the state of the body, and thus its performance. The difference between a good shot and a bad one is a matter of mind, not of technique. 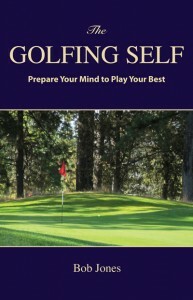 When you have a clear idea of the state of your mind when you hit good shots, you can then teach yourself to repeat that state of mind at will. How? Before you hit any shot, in practice or in play, retrieve that feeling of calm confidence, then hit the shot. Constant repetition is the key to developing your mind in this way–it’s not there for the asking. By doing this, you will develop good shot-making skills much faster, and you will achieve the mental consistency you need on the golf course. The second thing to review is the mental decisions you made. Affirm your decision-making process when it led to you to the right decision, and correct it in review when there was a flaw–not for the purpose of saying, What if, but to get it right the next time. This is teaching yourself to think like a golfer. The last thing to do in your review is look for shots that keep your score up because you don’t know how to hit them–chipping out of the rough might be an example. Then fix them. If you had a headache, you’d take an aspirin right away, wouldn’t you? So if part of your golf game is giving you a headache, get a lesson. Right away. For a long time, I didn’t have a very good pitching stroke. Those 50- to 100-yard shots were pretty tough. So I finally decided that whenever I hit a bucket, half the bucket would be devoted to hitting pitches. In just a few months, I got the stroke down and the results were magnificent. Each shot was crisply struck, took off with authority, went straight, arched high, and stopped near where it landed. Then I put two and two together. Why not build the swing I use for pitching into the swing I use for full shots? This is what the pro was talking about. He was bringing all the right elements of striking the ball—-tempo, releasing the club through impact—-into the full swing. The full swing is just a longer pitch. I want you to try this. Start working hard on your pitching game with your sand wedge. Get a lesson if you have to. When you’re hitting pitches that fly high, straight, and bite when they hit, you’re ready to learn how to extend that same swing into your full shots. Now go through the bag one club at a time. Learn to hit your pitching wedge this way. Hit some pitches with your SW, then hit your PW. Keep going back and forth until your SW and PW swings feel the same. Then move on to your 9-iron, and again alternate between your SW and 9-iron. When that’s successful, move on to your 8-iron, same process. Never move to the next club until you are completely confident with the one you’re working on. This carries confidence over to the next club. Otherwise, you carry over doubt, and the program beaks down. It might take you a week or more to get it right for one club. Keep at it, one club at a time, until you’re hitting your driver with this same, smooth swing. When in doubt, go back to the wedge. In fact, never leave the wedge. That club is your foundation. Let me assure you that I don’t mean for you to swing your 5-iron or your driver with the identical swing that you use with a sand wedge—-short, small, and without much clubhead speed. As you move up to longer clubs, the swing feeling you carry over from the sand wedge will naturally adjust to swinging a longer-shafted and straighter-faced club as it was designed to be swung, but with the same light feeling that you use with the sand wedge. The result will be a shot that goes straight, and you won’t lose a yard from what you had been getting. I cannot overstate how easy it is to learn how to hit the ball straight if you use this approach. If you are willing to throw out your old swing and its bad habits, such as lurching into the ball, guiding the club into the ball, swinging with a tempo that is far too fast, etc., you can become the accurate and consistent ball-striker you long to be. Commit to this program and you’ll improve so much it will be like you’re a different golfer. The fun of the short game, as well as its frustration, is that you will never hit the same shot twice. There will always be a different lie, a different amount of fairway to cover, a different amount of green, different contours, different green speeds, all of which add up to having to use your imagination to a degree if you want to get the ball close to the hole. That means being aware of the variables of short shots and being able to control them. Then you can add a little of this or take off a little of that to tailor your shot to the precise situation in which you find yourself. There are only five variables affecting the shot: loft, angle of approach, club path, clubface alignment, and clubhead speed. The parts of the shot that these variables affect are distance, direction, trajectory, and spin. The art of the short game is in controlling those variables. Loft affects how high the ball flies in the air and how far it rolls after it lands. A high-flying ball, for example, gets over obstacles and stops quickly when it lands. All that counts is loft at impact. Vary loft with the club selected, by de-lofting the clubhead at address, opening or closing the clubface at address, varying ball position at address, and by varying the angle of approach. Angle of approach is the angle to the ground the the club makes as it meets the ball. The clubhead can be moving parallel to the ground, or coming down at any selected angle. The closer to parallel the clubhead is traveling at contact, the higher the ball will fly because the effective loft of the club is greater. Angle of approach also affects the amount of spin that is applied to the ball. This variable is best controlled by ball position at address. The closer to your right foot the ball is, the steeper the club will come into the ball. A more or less wristy swing will also affect this angle. Club path governs the direction the ball will go after it is truck. It is not the only influence, though. There is a complicated relationship with the clubface alignment that is the true determinant of this direction. The ball will tend more toward where the clubface is pointing than where the club is being swung. An open or closed clubface, best set up at address, also puts sidespin on the ball, affecting where the ball rolls after it lands. Clubhead speed determines how far the ball will go after it has been struck. Also, the faster the clubhead is moving, the more spin that is applied to the ball. Swing speed can be varied by changing the tempo of the swing, changing its length, how the club is released through impact, or by gripping up or down to change the length of the club. The alterations you make in the shot to affect these variables interact. When you make two alterations, they can work in an additive way or negate each other. Be aware of that when you test these alterations around the practice green. Pay attention as well to the degree of alteration needed to achieve a desired result. Remember that the test is how distance, direction, trajectory, and spin are affected. A final variable is the ball itself. A Tour ball accepts more spin and is more responsive to variations in the stroke. It will also accept more spin in a full shot, so if you curve the ball to a pronounced degree when you swing, a Tour ball might not be the best choice in spite of its value around the green. Short post today. Yesterday morning I was at the range and I tried something different on uphill and downhill putts to get the distance right. For the uphill putt, I gripped the putter at the very end of the handle. My left little finger was barely on the club. That has the effect of lengthening the club, giving the stroke a little more speed without any more effort. I usually leave uphill putts short of the hole, and this trick did get the ball closer. I tried the opposite for a downhill putt, by gripping down from where I usually hold the putter, thereby shortening the club, which takes off speed. That didn’t help as much, though I must say that I’m pretty good at downhill putts already and don’t need this kind of assistance. You might try it, though, lengthening or shortening up on the grip to adjust for slope. Then you hit the ball using the same pace as you would for the length of putt you are facing as if it were a putt across level ground. I can’t say anything conclusive about this trick, because I only played with it for a few minutes. It’s just another variable that might help. It’s not unusual for a golf ball to wind up on a cart path. It’s also not unusual for a player not to know what to do. A cart path is an immovable obstruction (See Obstructions, Definitions; Rule 24-2). You get a free drop from the cart path, but it has to be taken at the right spot. That spot is based on the nearest point of relief. Many people think this point is off the side of the path closest to where the ball is resting, but that is not so. Remember that the nearest point of relief is the spot where the ball would lie when you take a stance, with the club you would normally use to hit the upcoming shot, in the direction you would be hitting it, and not be interfered with by the cart path in any way. The best way to determine the nearest point of relief off a cart path is to establish a point of relief on each side of the path, marking each one with a tee, and then measuring from the ball to each point to find which point is the nearest to where the ball lies. Once the nearest point of relief has been found, measure one club-length away from that spot, but no nearer to the hole, and put another tee in the ground. Use any club you like to make that measurement. If it’s your driver, take off the clubhead cover first. Pick up your ball from the cart path and drop it so it hits the ground somewhere between the two tees and behind the line between them. As soon as you have a legal drop, play on. If the ball rolls back onto the cart path, you must drop it again. If the ball rolls onto the path again, you must place the ball as close as possible to the spot where it hit a part of the course, usually the ground. What happens if the cart path is right next to a bush, and the nearest point of relief is inside the bush, and one club length from it would be either inside the bush or in a place where the bush obstructs your swing? You can substitute “tree” for “bush” and the problem is the same. Those objects are not obstructions, but part of the course, so you get no further relief from them. The answer is that you might be better off playing the ball as it lies on the cart path. Just because you can take a drop doesn’t mean you have to take a drop. Once you pick the ball up, though, you are obliged to drop it, so think about it first. 1. Find the point of relief on each side of the cart path and drop the ball within one club-length of the point closest to the ball, but no nearer to the hole. 2. If it is difficult or impossible to play from there, you might have to play the ball as it lies on the cart path. Two days ago I suggested that you might find it rewarding to spend a year starting over and learning to hit the ball the right way instead of putting patches on your mistakes. Let me spend today’s post talking about what it means to hit the ball the right way. That means to hit the ball on the center of the clubface every time. To get consistent results you have to hit the ball consistently. There are many variables you can put into your shotmaking, but there must be one constant that those variables play off of, and that constant is hitting the ball on the center of the clubface. If you want a good short game, you don’t build it around a bagful of shots. You build it around a predictable response every time you hit the ball, and the only way to do that is to hit the ball off the same spot of the clubface every time. Then you can add on variables that make the ball do this or that, but you know that when the ball does something different it was because of the variable you added on, and not from missing the strike. It pays to know how far you hit your irons, but if you hit the ball on different places on the clubface each time, you will never be able to take advantage of that knowledge to get the ball close to the pin. We all know about putting, don’t we? Every piece you read on putting that goes into it in any depth stresses the importance of hitting the ball on the sweet spot. You might have the perfect stroke for a twenty-foot putt, but if you miss the sweet spot, the ball will only roll eighteen feet. And off line. If you can hit the ball on the center of the clubface every time, you don’t have to practice very long to get your feel for a particular shot. Hitting the ball all over the face leaves you confused at the range and guessing on the course. So if you want to take me up on the one-year program, spend it doing this. It is the end of the golf stroke. Swing mechanics are the means. To learn ball-striking with this end in mind, you will have to swing the club correctly, no matter what the shot is. You can’t hit the ball consistently on the middle of the clubface without doing a lot of other things right at the same time. Start with your putter and see if what I just said isn’t true. By the time you have developed a stroke that lets you hit the ball on the sweet spot consistently, you will also have developed a stroke that returns the clubface square to the starting path and moving in line with it. It can’t happen any other way. Then transfer that awareness to the rest of your game, one shot at a time, one club at a time. Be honest. If you’re not very good and not getting better, you know it. You don’t have to tell me, you don’t have to tell anyone else, and it’s not a judgmental thing. But if you don’t hit good shots very often, and you want to do better, what do you do? You take lessons, and practice, and play, and nothing changes, or maybe it changes a little, but not in the way you want it to. Today I’m going to talk about how your entire approach to improving might be what is holding you back. There will be no swing tips here, no instructions on how to hit a new shot that will turn everything around, just a sit-down discussion on why starting over might be the best way to free you up to be the good golfer you believe you can be. Last Sunday I went to visit my son for Easter dinner. He’s learning golf as an adult. He’s 37 years old right now, and has been at it for about six or seven years. This is how he started–get some clubs, go to the range, swing away. Maybe if you’re an original genius, you can get away with this. An example is our current Masters champion, Bubba Watson, who is entirely self-taught. My son is not that way. Might not be you, either. A few years ago, after suffering through round after round of whiffs, shanks, and 10+ lost balls per round (I’m not kidding. I play with him. ), my son decided to take some lessons. The lessons are going all right, but he doesn’t have them that often and I’m not sure what he’s practicing in the meantime. He does want to become a good golfer, though. So when we were sitting in the TV room before dinner, I told him something quite plain. I said, you are playing with a weak foundation. The way you swing now still has many remnants of a swing based on a conception of movement that contributes little that is good to hitting a golf ball well or at all. What you’re doing now is putting patches on patches, trying to fix a swing that is unfixable. I said, you have to be willing to start over again. Learn how to do it right from the ground up. Learn how to putt. Learn what a professional putting stroke is. Learn how to look like a pro, feel like a pro, and move like a pro when there’s a putter in your hands. Get a conception of movement for this little stroke that is different from the one you have now. And then when you have it, move on to chipping with the same goal. Look, feel, and move like a professional golfer with those little shots. If you keep doing this, I went on, working your way up to a full swing, then after a year of steady effort, you will be the golfer you want to be–someone who is in control of every shot. You will be someone who knows the ball is going where he intends rather than someone who hopes the ball will maybe go there this time. You will be someone who can plan his way around the course because you know that your plans will work out more often than not. Reader, I don’t know where you are in your game. I don’t know what kind of a foundation you have for golf and how much you’re improving, if at all. I understand that the way you play now might be all right with you and that making a serious, time-consuming commitment to golf beyond what you’re giving the sport right now would take you away from other things more important to you than golf. If that’s not you, there is no reason why you can’t be a much better player than you are now if you are willing to devote one year to a program like I outlined above, working your way up from putting to swinging. One year is not a very long time to spend on earning a lifetime of first-class golf for yourself. This is a shorter time than it would take to learn to play a musical instrument well, or speak a foreign language well. Start over. Instead of spending your time on correcting things that are wrong, spend your time learning only things that are right. If right things are all that you do, how can you go wrong? With a golf game built on that kind of a foundation, the way is clear to being as good as you want. Be my guest.